Last week I mentioned that it was a sluggish blogging week - and that two things had happened. But I only told you about one of them. The second one was pretty exciting for this little ol' blogger. The dresser planter that I made last year was featured on goodhousekeeping.com. Woohoo! Pretty exciting, huh? You can catch up with my vast fame here. So I thought this would be a good time to discuss how this dresser held up in the heat and rain of summer. This is what it looked like in July. I think the color combinations were really pretty. I don't think I will try chives in a small opening planter again - a little droopy for an upright plant. I was pretty pleased with how everything else grew in. The sweet potato vine had to be trimmed a bit but that was no problem. The CeCe Caldwell paint (now american paint company) held up perfectly on the all of the surfaces except the top. The top of this dresser had a small crater/crack on the top of it. It looked like a 40 pound bocce ball had been dropped on it in one spot. This spot filled water every time it rained (and it rained A LOT). This caused the top to crack and basically become ugly and very damaged. I was very pleased with how the paint held up though. So, in October when it was time to clean up for winter I opted to just empty the dirt out of the drawers and put the whole thing on the curb for the trash. FYI - having the dirt in the drawers without a lining did not make them unusable. This spring I was kicking myself just a little. I was thinking that I should have just ripped the top off and replaced it with some reclaimed wood. Putting the whole thing on pavers to keep it from sitting in water was a great idea. There was no damage to the base of the dresser. This ends my report on the life and times of a dresser planter. All in all I feel the project was successful and I would make another one in a heartbeat. That is if I find another $5 dresser to convert. 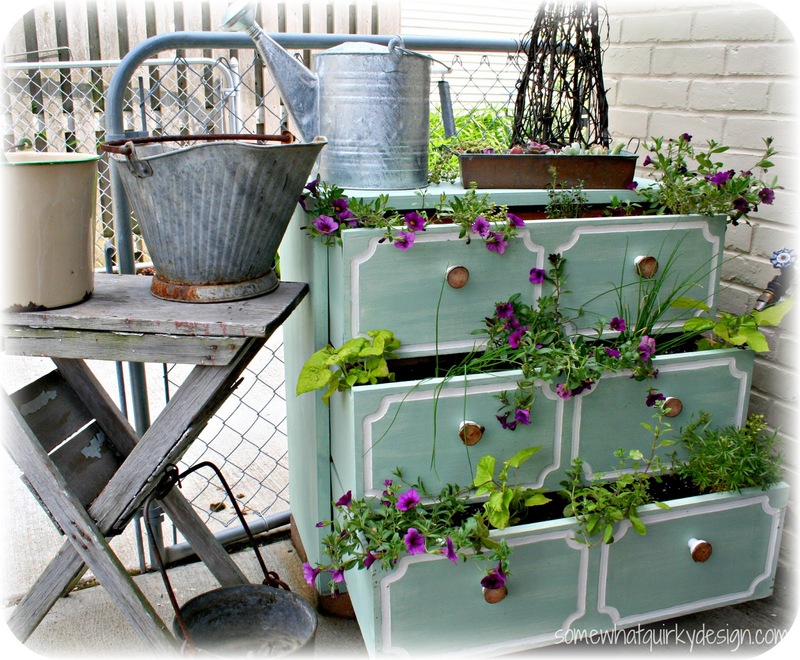 For more information for how I built the dresser planter go here. It looks super cute! Love that rustic table at the side too. I already had a garden dresser is on my to do list for summer. I know that it might eventually rot completely, but we will enjoy it in the meantime. I love it! If I could find a really cheap dresser, I would totally do this! I know someone famous! Congrats! Love the dresser! That was such a fabulous project and thanks for the tips on what to do if I ever get around to making one to keep it a little more outdoor friendly. Sad that it hit the curb. I hope you do another one too and are able to keep it! 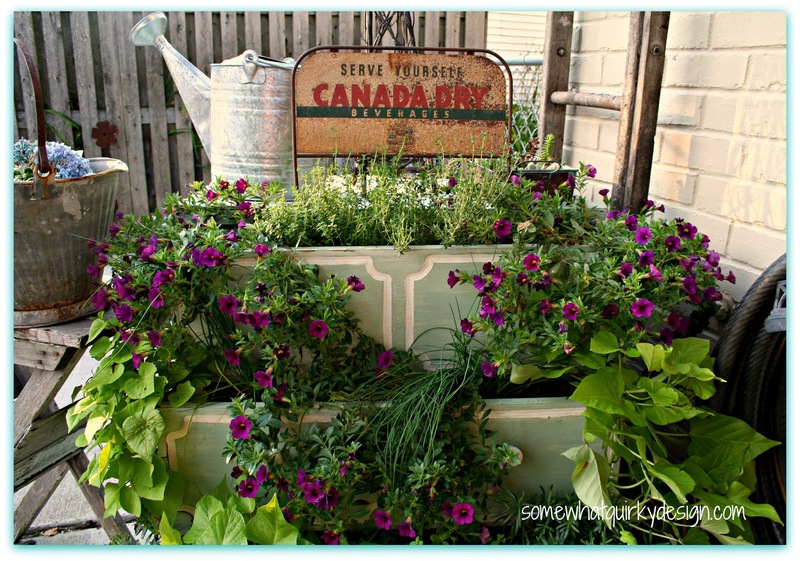 What an amazing planter you created! Can't believe you tossed it - you run around constantly salvaging things and then tossed THAT????? Beautiful - hope you make another one!!! What a fun idea! Glad you posted your thoughts on how it held up after a year. Live and learn. Experience is such a great teacher. Love the color you picked for the dresser. Its looks great with those purple flowers. I bought a crummy nightstand that I keep moving around the garage....I think I'll just make a planter out of it and call it a day! It should hold up well on my covered porch I think.....my husband will be SO glad to have me take something ANYTHING out of the garage. Can I have your autograph too? Totally adorable! Thank you for sharing with the Clever Chicks Blog Hop this week!